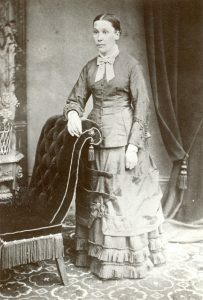 Hannah Mary Hopper was the daughter of Henry Hopper and Mary Ann Pitcher, born in 1846 at Little Mongeham, Kent, England, one of at least four children (Sarah, Henry and Stephen). Henry Hopper was an agricultural labourer and shepherd. In the 1861 census Hannah Mary is a house servant for a family of eight children on a farm in Sholden, Kent. and in the 1871 census she is a cook/domestic servant for Captain R. Douglas of the Royal Navy in Walmer, Sandwich. She and John White were married in 1872. The photograph is supposed to be of her, according to the family album. Hannah Mary died in 1898.